Relaxed and ready to chat! This Sunday I will be running in my 13th Reading Half Marathon. I cant wait to race! Nothing beats heading down the ramp into the Madejski Stadium after 13 miles to the sound of roars and cheers from the Reading crowds! Reading is my home town I use it to test my 4 legs in the run up to my 19th London Marathon on 26th April. * my Sheikh (“Sheikh-a-leg”) will be running with us to keep us on track. He warns other runners that I am on my way to the front, and helps me take on water at the water holes! 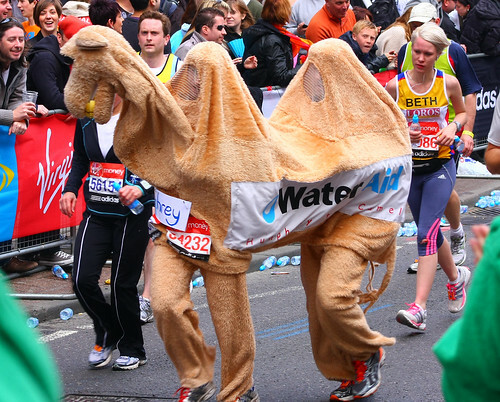 Humphrey runs to raise money an awareness for WaterAid. Its quite fitting that Sundays is on World Water Day. This year I am raising money for water and sanitation projects in Bangladesh. Finished the Goring 10k in 58:50. Was a lovely sunny day, bit of a chill in the air and a cross wind, but tucked my ears back and pressed on. “Sheikh-a-leg” was very happy with my performance. 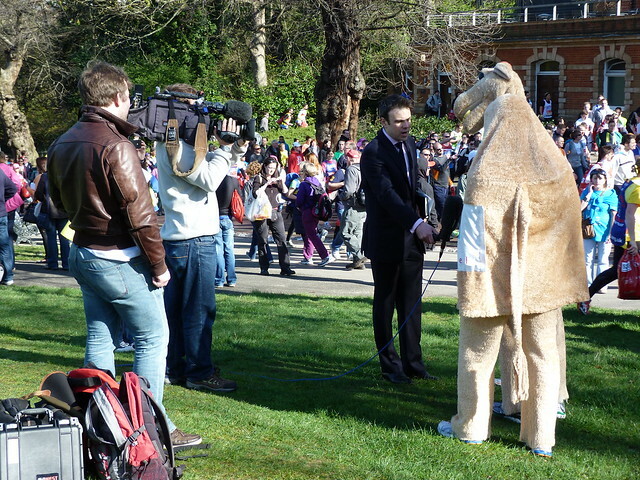 I had Abu the Monkey along for the ride, to spur me on and to take a few snaps for my fans! The lure of running a race superceeds whether its a fair contest or not, or whether you are likely to win the race. 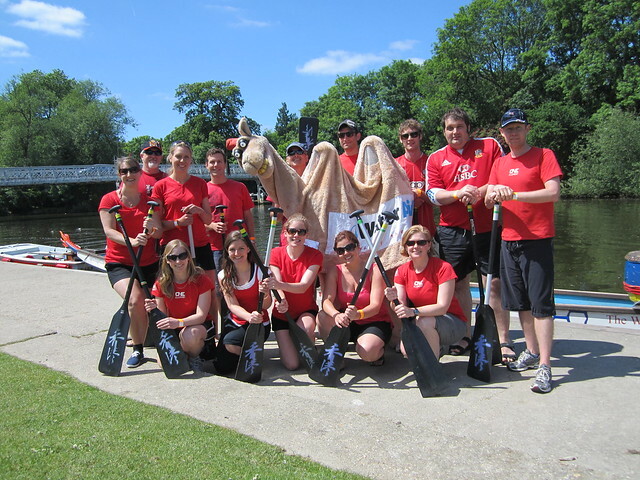 On Saturday the 8th January, my team “Humphreys Furry Friends” competed in the Pangbourne Rotary Charity Dragon Boat Challenge 2013. The Rotary club organise the event anually and raise money for charity. This years chosen charities were the The Alzheimer’s Society and Duchess of Kent House Trust. I was set the challenge of recruiting a new team to compete alongside the regular supporters (mmm I was kinda nudged out my boat). Well what a team I managed to select. I was tempted to pull a couple of Olympians but resisted and instead found a team of commited and enthusiastic novices willing to give their all out on the water. The day was setup perfectly with clear blue skies and plenty of heat. With bundles of nervous energy we headed onto the Thames for our races. Wow what a day. I was so chuffed with my team managing to click together so quickly. Timing and power coming together to drive the dragon boat forward, it was a thing of beauty to watch! I am so looking forward to next years racing already! Thanks go out to my team for giving their all, the Henley Dragon Boat club for providing the boats and guiding us through the day and the Pangbourne Rotary Club for organising such a fantastic event. ps do drop me a line if you would like to enter a team into next years race and lets really get behind the Pangbourne Rotary Club. I’ll try write a full race report once my feet have recovered! Thanks for all the support and well wishes. We are up to £3815 and would love to hit the £4000 mark.